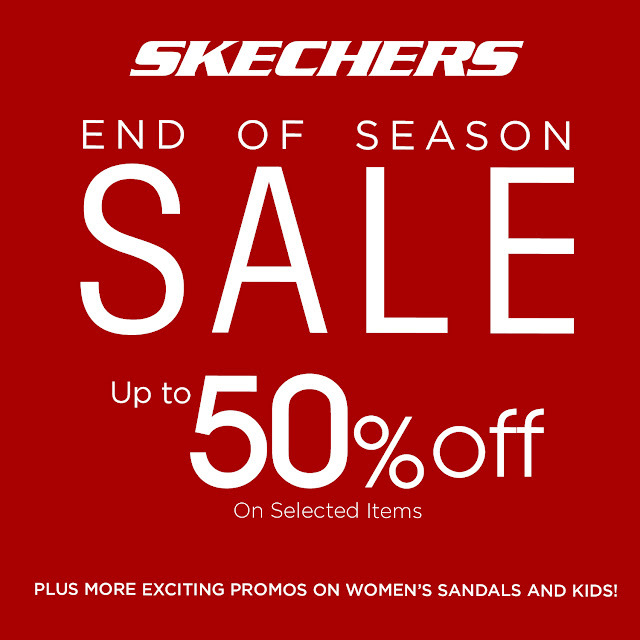 Home / Beauty / Deals / discount / End of Season Sale / Fashion / Health / sale / shoes / shopping / Skechers / Score up to 50% Off On Your Favorite Shoes at Skechers’ End of Season Sale! We know you don’t need much convincing to shop for new shoes, but Skechers is giving you more reasons to own comfy and stylish pairs with the Skechers End of Season Sale happening this whole month of February! Enjoy up to 50% off on select Skechers items in all Skechers stores nationwide. Not only that, Skechers is offering more promos for the shoe lovers! Get one pair of sandals for free when you buy a pair of Skechers sandals. Stock up on Skechers Kids shoe styles priced at only P1,200. Like all things floral? Get two pairs of Skechers Women’s Sports footwear in florals for only P4,995! Hurry and grab a hold of these comfortable and stylish shoes before they run out! To know more about Skechers Performance’s latest collection, visit www.skechers.com.ph www.facebook.com/SkechersPerformancePH and @SkechersPerformancePH on Instagram.